Here are some links to the robot collection. This is a evergrowing list. I'll try to upgrade it soon. 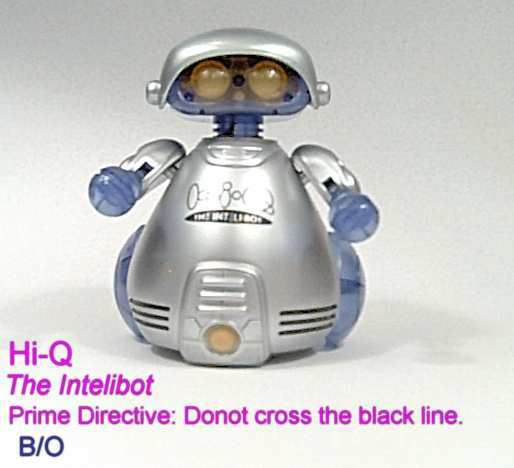 Also I am trying to keep links of toy stores and other commercial websites who sell robots, out of this list. If you know a non-commercial website about robots feel free to e-mail me the address I will review it and place it below. Wife kidnaped by aliens, kids runaway, have to move to planet Uranis, whatever is the auctioner's reason, the robot you always wanted is up for bids. Just be there at the right time. The great portal for collectors. R0B0T GALLERY : One of the best website, lots of pictures, info and links. ANDROID WORLD : A award winning site devoted to android. An android is an anthromorphic robot - i.e a robot that looks like a human. MORE R0B0TS . . .
Jeff's Robots : My favorite....I wish I had a WebSite that looks this good. Killjoy's Robots : Showcase of a robot collector. Robot's717's Robot Site : and you thought dog is man's best friend?? Robonut : The name says it all. Great website for robot collectors. Lot of picture and info. New Robots : What new robot is out there? Its all here. Robots in Portland : Ignore the name. One of the best & biggest websites, covers almost everything on robots, from AI to real robots. News on development of real robots and a huge list robot links. An internet based game that allows players to build their own robots using real robotic, train them for combat and then submit them to tournaments to win prizes and cash. Robots & Space Toys : A great place to start or re-start. Info, links, showcase, message board its all there. Great website. Toy Robot Collections & Museums : Pages after pages of shelves full of robots. I like to visit here again and again to compare sizes or search for different verson of a robot. A superb corner of the world wide web for toy robot collectors. Some day I hope to visit the 'Robot Hut' museum in person.